Podcasts can improve your knowledge quickly. Bas van den Beld gives you an overview of 25 podcasts in the categories tactical, trends, interviews, strategical and topical specialized. I often get asked how I keep up my knowledge in a fast-changing digital landscape. I get asked about my ‘secret’. The secret is simple: next to practice (“doing things”) I consume a lot. I try to understand what is happening by reading and listening to a lot. I read tons of articles, many books and I listen to many podcasts. As you may know, I travel a lot so podcasts (as well as audiobooks) to me are great. I can listen to them anywhere. On the plane, train, tube or when walking. And yes you read it correct, podcasts. You might have thought podcasts were something from the past. Something I used to create as well, back in the day. But podcasts are seeing a big revival. They are ‘hot’ again. There are new podcasts launched every day. Some good and some bad. 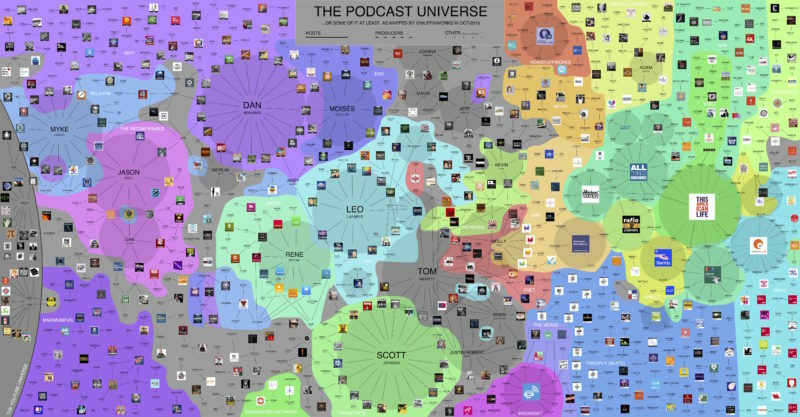 The landscape of podcasts is huge, as this overview from Muffinworks shows us (click to enlarge). Podcasts are a big part of my routine when keeping up to speed with what is going on in the digital landscape. I listen to many of them. Now I have to admit, I’m a bit weird in this. I listen to podcasts in speed x3. Which means a half hour podcast only takes me 10 minutes. For some this might sound strange because you’re basically listening to the ChipMunks presenting. But for me, it works. I do know it won’t work for everyone. But which ones to listen to? The question always is, when listening to podcasts, which ones to listen to? Especially if you don’t listen to them at warp speed, you can’t listen to them all. A good place to start could be MarketingPodcasts which was set up by Jay Baer. This site has most of the (marketing) podcasts in one place, with reviews and audience approval ratings. But that still means you need to start searching yourself. So I decided to ‘come to the rescue’. Below I’ve divided some of the podcasts I listen to into different categories. They are all about marketing related topics. But I’ve made subtopics: tactical, trends, interviews, strategical and topical specialized podcasts. This way you can choose what you want to get out of a podcast and choose from there. Of course, at the end, I am curious which podcasts you feel I should listen to, next to these. Enjoy! The tactical podcasts have a strong focus on, what else, tactics. This means you get instant tips and tricks you can use to improve your marketing skills. 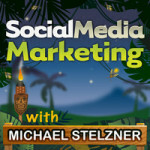 The Social Media Marketing Podcast actually is a mix between interviews and a tactical podcast. But host Michael Stelzner makes sure that he asks the questions that help the listeners forward. You get to learn what tactics experts have used in their businesses. Every episode has its own topic so you can easily see if an episode would interest you or not. This podcast is fast, to the point and gives insights into businesses as well as strategies. The length is just right and it provides not just tactics, it gives me ideas as well. 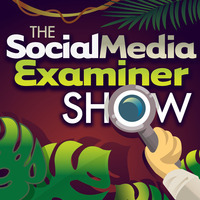 The Social Media Examiner Show is the little ‘sister’ of the Social Media Marketing Podcast. It’s much shorter and very tactical. This is because they take articles and quick tips from SocialMediaExaminer.com and turn them into a podcast. They turn them into what they call “snackable social media content”. It’s quick (only a few minutes per episode). And because you can pick which topics are interesting for you very to the point. It makes reading blog posts a lot easier. 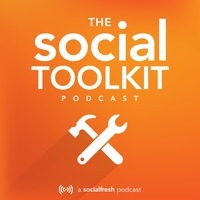 The Social Toolkit is a show about tools (who would have guessed). They look at tools, software, apps, services and how digital marketers use them. They talk tactics as well as processes. This is a hands-on podcast that has helped me find plenty of useful tools. In the past few months, they’ve done more strategical as well as marketing tactical episodes that are about more than just tools. I stumbled on this podcast by accident a few years ago and have now listened to almost every episode. 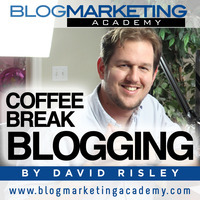 David Risley, from BlogMarketingAcademy.com, brings a lot of tactics every episode for bloggers. These are tactics that vary from conversion tactics to actual monetization tactics. It extremely hands on and easy to listen to. They are short (15 to 20 minutes) and very tactical. Another one I stumbled upon by accident but have gone to love a lot. 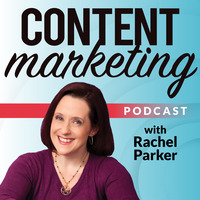 Rachel Parker talks content marketing in the Content Marketing Podcast. She is very tactical and sometimes the level might be a bit too much focused on beginners. There is always one idea however she will give me in every episode that I can use. In the past few months, she’s also been doing interviews with people in the content marketing industry. Those interviews are longer than the regular episodes, which are about 20-25 minutes. 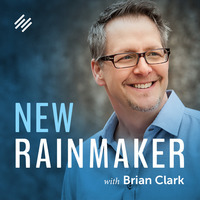 The Rainmaker show is a classic in digital marketing podcast world. Copyblogger founder Brian Clark every week has a guest to talk about specific topics. This could mean this podcast fits the ‘interview’ section as well. Like the Social Media Marketing Podcast Clark focuses a lot on the tactics, which is why it’s in this category. 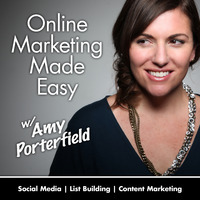 I started listening to Amy Porterfield because of her knowledge of Facebook. Together with Jon Loomer, she is the go-to-person when it comes to Facebook (Advertising). Her show has changed in the past year from just Facebook to wider topics. It still is a great show with a lot of tactical information. Some things are ‘simple’, sometimes she goes more in depth, especially with guests. 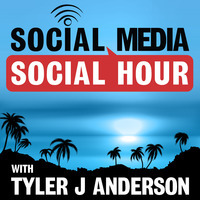 This show could be in the Interview section as well because host Tyler Anderson tends to get the tactics in the show by interviewing experts like Mari Smith, Jay Baer, Chris Brogan and other social media marketing professionals. He discusses tactics they use and how we should look at the different social networks. Very much focused on Social Media of course, but extremely useful on a broader topic like Digital Marketing in general. 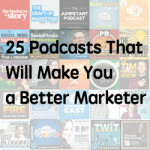 New Rainmaker, Social Media Examiner & others in this great 25 podcasts list. Awesome! The Trend Podcasts have a focus on latest developments. What is changing, is Twitter still alive or should we all move back to Google+? Those types of questions you will be able to answer if you follow (some) of these podcasts. They focus on latest developments in the industry. This podcast is my absolute favorite in this section. 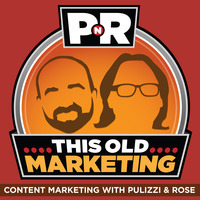 Every week Joe Pulizzi and Robert Rose discuss the latest trends in Content Marketing. And luckily they don’t ‘just’ stick with Content Marketing, they go broader as well. Pulizzi and Rose offer funny dialogues combined with really practical insights and trend analysis. They discuss developments and each week pick out some articles to discuss as well. They talk about their views, have rants and raves and my personal favorite part: they give an actually “Old Marketing” example from the past. Something we can learn from. As a historian, that of course is a beautiful add on to a great show. The next two podcasts come from the same network and have been very popular in the industry for years. You will also need some time to listen to them. These are the longest podcasts in here, running up to more than an hour and a half. 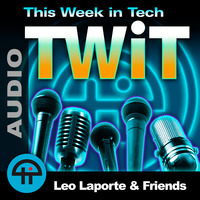 This Week in Tech is the original podcast from Leo Laporte where he discusses what is happening in Tech. Now this isn’t directly marketing (nor is TWiG), it still touches on trends you need to pay attention to. TWIG, This Week in Google, is one of the shows in the TWiT network that has the same format (a round table discussion) and often touches on marketing a bit more. 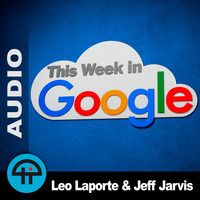 With regular guests like Jeff Jarvis the latest Google and cloud computing news. You might see Matt Cutts or Danny Sullivan show up in this show once in a while. A unique element of the show is that you can also watch the show, not just listen to it. The Social Pros Podcast is hosted by Social Media Guru Jay Baer and Salesforce’s Adam Brown who has replaced Jeffrey Rohrs (author of ‘Audience’) this year. They discuss the latest trends in Social Media, often accompanied by a guest. The show is extremely popular amongst social media experts, especially in the US. The reason is that it is diverse, touching on trends, debunking myths and discussing insights. A great one to keep up to speed. Finally, in this category, it’s Marketing Over Coffee. 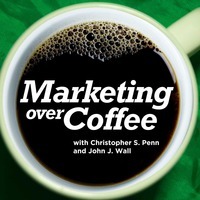 In this podcast John Wall and Christopher Penn discuss (‘over coffee’) what is new and what we should keep our eyes on. 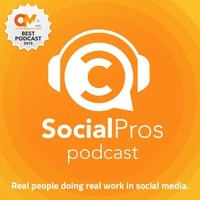 Social Pros Podcast, P&R Old Marketing and others are on this 25 podcasts list! There is a lot to learn from others. Why would you want to make the same mistakes? Or why not learn a short cut? That’s where this category is very useful. Podcasts in which people are interviewed. 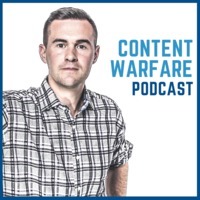 In Content Warfare, Ryan Hanley interviews guests with big names. People like Chris Brogan, Marcus Sheridan, Mark Schaefer and Gini Dietrich have shared how they became successful. In recent podcasts, he has also been giving away parts of the audiobook with the same name. 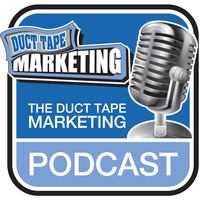 Duct Tape Marketing doesn’t necessarily focus on the big brands. It uses the big brands to get thought leaders on that can help small businesses. John Jantsch interviews experts to get knowledge out. 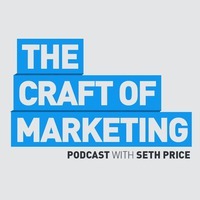 The Craft of Marketing is hosted by Seth Price. Price interviews entrepreneurs and experts to give the listener direct strategies, tips, and tactics. I am personally a big fan of this podcast because it has a specific focus: marketing books. Now many guests come on other shows to promote their books, but this one is made just for that. It gives the listener some great ideas on what books to buy. Douglas Burdett interviews best-selling authors for the smartest thinking on social media, digital marketing, sales, B2B marketing, content marketing, inbound marketing and more. 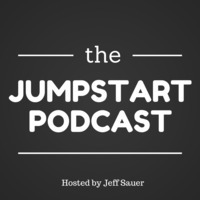 A relatively new podcast with interviews is ‘Jumpstart’. In a short period of time the host, Jeff Sauer managed to get big names in the SEO and Content Marketing industry to hop on board and discuss the strategies they use. People like Mike King, Lee Odden and our own Aleyda Solis already featured here. Sometimes you hear trends, you read books and you listen to talks and you think “what now”. But you don’t need tactics right away, you need a strategy first. But how to get there? The podcasts in this category are aimed at just that: making you think about strategical directions and decisions. 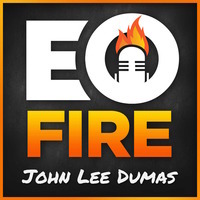 Entrepreneurs ON FIRE is a podcast hosted by John Lee Dumas and is regarded as one of the best podcasts currently available. As the title suggests, Dumas talks to entrepreneurs, touching on their journeys, lessons learned and how to go from idea to strategy to action. A highly recommended listen. 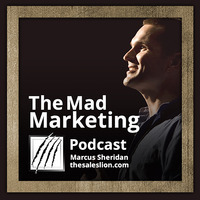 Marcus Sheridan has a background you might not expect with a marketing podcast host: he sells pools. He figured out marketing, made that a success and now is also a successful marketer. A great person to learn from. I specifically like his podcast, not just for tactics, but because he makes you think about things. And he’s as real as it gets. 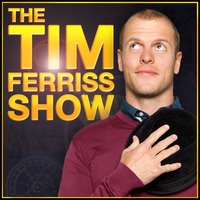 If you have read the book “The 4-Hour Workweek” (and I presume many of you have), you will know the author of that book, Tim Ferriss. Ferris has become a person that everyone looks at, inside and outside of the industry. Although I’m usually skeptic about ‘overhyped’ personalities. He lives up to his reputation of ‘out-of-the-box-thinker’ in his podcast. Which can lead to interesting thoughts about where to go next. Yes, he talks tactics and tools as well, he mainly makes you think. In this final category, I want to look at podcast with a specific topic. So not the ‘general digital marketing’ topics, but more specific, more specialized. These podcasts will help you get further into specific topics. 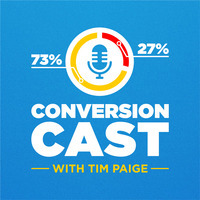 First up is ConversionCast, a podcast about, what else, conversion optimization. We don’t just look at visitors anymore, we look at conversions. And ConversionCast helps you understand better how to get a grip on this. With case studies and tactics, this is a very useful podcast. Keep in mind it comes from Leadpages.net, which is a conversion platform. This means there is some commercial content in there, but who can blame them. 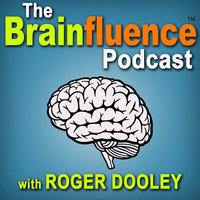 If you are into psychology and neuromarketing you will love the Brainfluence Podcast. This show is hosted by the author of the book “Brainfluence: 100 Ways to Persuade and Convince Consumers with Neuromarketing”, Roger Dooley. Dooley looks at trends in neuromarketing and interviews guests that have specific expertise on the topic, giving you instant tactics and strategies you can use. 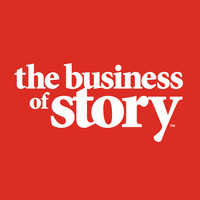 The podcast “The Business of Story” is one that goes beyond digital. This is about storytelling and how your business can benefit from it. The Business of Story podcast’s goal is “to help you craft and tell compelling stories that sell”. This means they share stories from businesses that made storytelling part of their strategies. Very informational, very well produced as well. 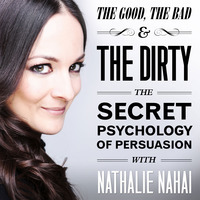 We have interviewed Nathalie Nahai, the host of “The Good, the Bad, and the Dirty: The Secret Psychology of Persuasion” who goes under the name of The Web Psychologist before on State of Digital. She is extremely knowledgeable on the topic of persuasion. In “The Good, the Bad, and the Dirty: The Secret Psychology of Persuasion” she interviews other experts on the topic and with that adds her own knowledge. I’ve been fortunate enough to have been one of the guests on Nathalie’s show before. Not for that reason, but for 99 other reasons (it now has 100 episodes when writing this) it’s worth a listen! What Podcasts do you want to add? These are only some of the podcasts I personally listen to. But I am sure I’ve still missed some beauties out there. So I would be extremely curious about your choices. So let’s built out this list. What podcasts should be in here? Leave a comment here or on Twitter and we’ll add them to the suggestions list in this article (and we’ll add ‘suggested by’ to it!). Here is a list of podcasts suggested by you, the readers! Is Facebook The Future of Video? This is a really useful list Bas, thanks for sharing! 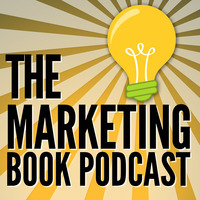 Bas, I’m thrilled and honored that The Marketing Book Podcast made your list! Thanks for your kind words about the show. BTW, have you read any good books lately? I really really enjoy your show Douglas. There are plenty of books I would recommend actually :-). And I’m actually writing one myself ;-). DM me on Twitter and I’ll send you some suggestions for books. Cool :). It was already on the list Sam! Looking forward to yours. Cheers for the list Bas, lots to get stuck into! Audible works great for me with audiobooks, but never really had much luck with it for podcasts. I’ve tried a few others, but most have seemed quite clunky or just allow streaming rather than downloading for listening. I’ve not come across stitcher before so may give that a try. I personally use Pocket Casts. Pretty good. Stitcher is ‘ok’ as well, though had to get used to it, though good thing is that you can manage your podcasts in your browser for free, whereas with PocketCasts that is a paid feature. Thanks, I’ll have a look at that one too! Haha ‘For some this might sound strange because you’re basically listening to the ChipMunks presenting.’ Love it. Great list for sure, thank you! I know you can’t include every single marketing podcast but just wanted to mention Unbounce’s Call to Action podcast. We cover remarkable online marketing success stories, and how you can apply them to your own campaigns! We just celebrated our one year in production, and our latest episode is a conversation about what we’ve learned, what has worked, and what hasn’t (for any other podcasting nerds out there).